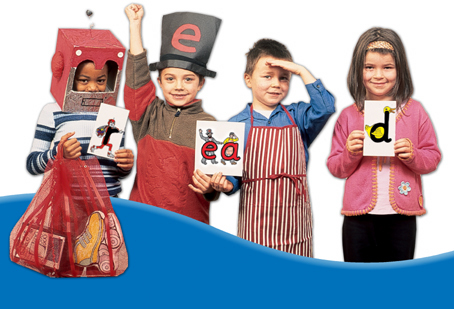 Letterland is a child-friendly, multi-modal system for teaching children to read, write and spell. The secret of its worldwide success lies in its pictogram characters and their ability to make learning fun! Letterland is an independent UK publisher, specialising in child-friendly phonics and literacy for children aged 2-8. Our well structured and language-rich approach features visual mnemonics, actions, stories and multi-sensory activities to keep young minds engaged in learning to read and write. The unique Letterland range of books and associated products are used worldwide. They deliver synthetic phonics and cover a-z, all 44 sounds and their spellings, blends, digraphs, trigraphs and early word building, as well as developing listening and speaking skills, vocabulary, imagination and play. Set in a delightful place called Letterland these pictograms are a careful fusion of letters and animated characters. These simple powerful images contain the basic phonic information that children need for accessing print. At a more advanced level, stories about their interactions provide logical reasons for all the essential recurring spelling patterns in the English language. The Letterland pictograms activate every learning channel, linking all the things that children love - social interaction, movement, art, craft, drama, rhyme, - directly to letter knowledge. The children can even sing about how to form each letter shape. The songs relate letter shape to body parts. The Handwriting Songs Cassettes/CD's make it easy for teachers to introduce this activity. Like us, Letterland characters have personalities, friends, homes and hobbies.